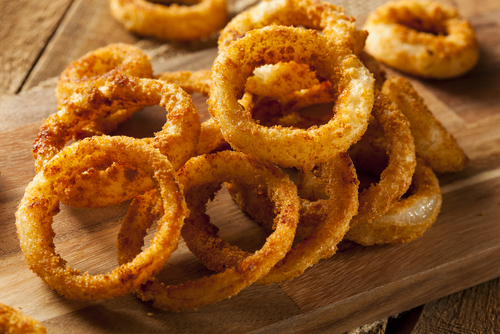 Before you prepare the onion rings, pre-heat the oven to 425 degrees, and line 2 pans with parchment paper. In a small bowl beat both of the eggs until there are not any whites shown. In a separate bowl, mix together all of the spices with the almond flour. Set aside. Grab a third bowl and add some of the dry mixture to the bowl, and line up the egg wash bowl with the breading and extra breading bowl. Slice up your onion to form "rings" and dip each ring in the egg wash. Make sure none drips, and then transfer to the breading bowl, and evenly coat the onion on both sides. Once the ring is completely battered on both sides, lay it on the pan to cook. If you need to add more breading to your bowl, use the third bowl. If you used one bowl for all of the breading it could become soggy. Once all of the rings are laid out on the pan, bake for 8-10 minutes until they are just browning. If you want a crispier bite, set them under the broiler for 1-3 minutes but watch them close so they do not burn. This recipe comes from wholesome yum.